How to cook chicken under cheese crust? 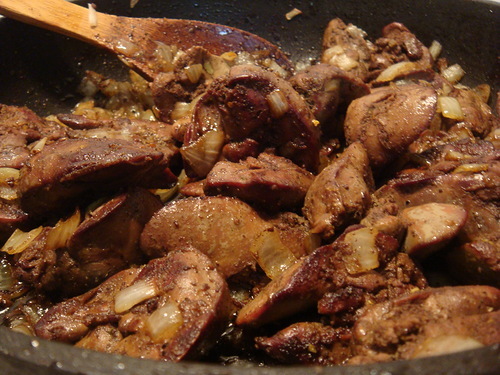 Chicken liver can be cooked many delicious dishes. To the liver turned out juicy and tender, just need to know some secrets and tricks. The liver spread out on a cutting Board, remove the veins and prostitue thoroughly with paper towels. In the frying pan oil over medium heat. If its overheating, then the liver will be burned. Perfect butter - melted, but if there is none, replace it with vegetable. Put into the pan first liver slices, adjust fire, observing, not if they are burning from the intense heat. The pan need to put one piece of liver, protecting the prepared dish from the rapid drop in temperature. If the pan has a juice and the liver is not fried and already cooked, then it should be removed, drain the liquid, and the process to start again. When you re-upload first go raw liver, and a semi-need to put at the end. While frying the liver does not need to be away from the plate. The cooking process requires constant turning of the pieces with pastry crimper. Frying each side takes about a minute and a half. Onions finely cut, add it to the pan when the liver is turned to the other side. Gently spread across the pan and lightly fry. If you want to prepare tender pink inside the liver, then after the bow is slightly potamilla, it is necessary to remove from the pan and in another bowl cover to keep warm. Onion cook until ready. In slightly fried onions add honey and soy sauce. Stir until smooth, allow to simmer until lightly thickened. Sauce to try and adjust the taste. In the prepared sauce spread to the liver, to warm it a few minutes and serve.